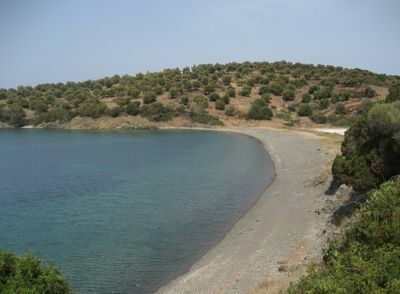 Kassandra peninsula. The coast hosts numerous excellent beaches. Located near the city of Thessaloniki. The only way to get around is from Thessaloniki Interurban Bus Terminal ("KTEL Chalkidikis"). The canal of Potidea, separating the Kassandra peninsula from the mainland. The byzantine watch tower of the Agios Pavlos, Mt. Athos monastery in Nea Phokea. The old traditional village of Athytos. The spa thermal baths of Agia Paraskevi. The summer concerts and theater festival in the amphitheaters of Nea Moudania and Siviri and the jazz festival of Sani. The chapel of the Virgin Mary on the seaside of Skioni. The ancient ruins of Zeus temple in Kallithea and of Poseidon temple in Posidi. Mostly fish and other sea food. The nightclubs around Kallithea are very popular and crowded. There are even customers who come from Thessaloniki just to drink and dance there. This page was last edited on 7 July 2018, at 07:14.